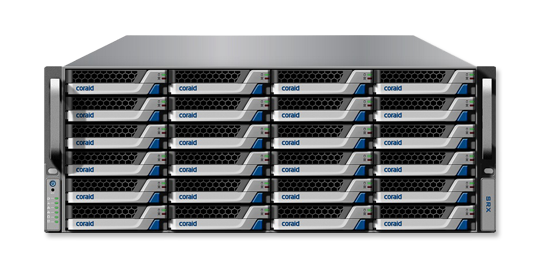 Coraid is redefining storage with its breakthrough line of EtherDrive storage solutions. EtherDrive delivers scale-out performance, Ethernet simplicity, and faster than Fibre Channel performance at commodity hardware economics. Designed from the ground up for big data, virtualization and cloud architectures, Coraid solutions have been deployed by more than 1,700 companies worldwide. 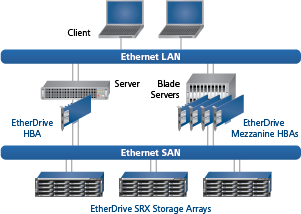 Coraid EtherDrive solutions provide enterprises of all sizes with flexible, high performance Ethernet SAN storage. Coraid uniquely delivers the fundamental building blocks for scaling out storage projects for virtualization, high performance computing, and cloud storage. Coraid solutions are trusted by companies in sectors including manufacturing, life sciences, software, healthcare, education, financial services, military, and hosting. 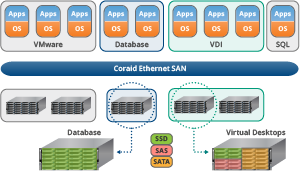 Designed from the ground up for simplicity and virtualization, Coraid EtherDrive enables lower OPEX and up to a price-performance advantage over legacy Fibre Channel and iSCSI systems, while dramatically increasing the flexibility of networked storage. Coraid EtherDrive is an Ethernet SAN system that leverages raw Layer 2 Ethernet and a distributed operating system to provide low latency, high bandwidth access to every drive on the network. Unlike Fibre Channel or iSCSI, Coraid leverages a massively parallel, connectionless protocol to enable cloud-scale deployments with all the simplicity of direct attached storage. The CorOS™ distributed operating system runs on every EtherDrive component and offers a single, global namespace for managing storage as a pooled resource. 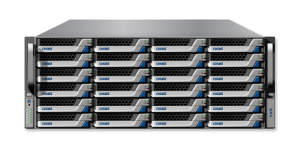 Coraid EtherDrive scale-out SAN solutions redefine storage, providing enterprises of all sizes with flexible, scale-out, high performance storage. Coraid EtherDrive is a distributed storage system that provides a simple, resilient and high performing architecture for cloud, virtualization, and big data. 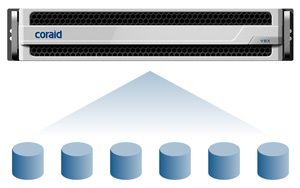 The Coraid EtherDrive VSX series centralizes and streamlines Logical Volume Management (LVM), snapshots, clones, and remote replication across the enterprise – quickly, and easily. It is the first storage virtualization solution to combine the price-performance and simplicity of Ethernet SAN with features such as logical volume management (LVM), snapshots, cloning, mirroring and remote replication. Coraid EtherFlash is a solution bundle that combines high performance flash drives with the scale-out architecture of Coraid EtherDrive to provide leading price-performance for I/O intensive applications. 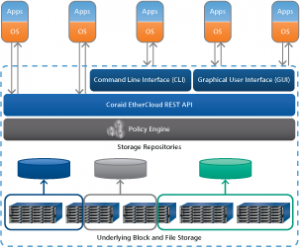 Coraid EtherCloud is the industry’s first software-defined storage platform for architects of the modern data center. EtherCloud enhances business agility by radically simplifying delivery of scale-out infrastructure. Ethernet Storage: A scale-out, connectionless, and massively parallel data architecture built on ATA over Ethernet (AoE). By leveraging the simple Layer 2 nature of Ethernet, AoE provides high throughput, low latency data access while virtually eliminating many management points that exist in today’s FC and iSCSI environments. CorOS™: A distributed storage operating system with a shared global namespace. 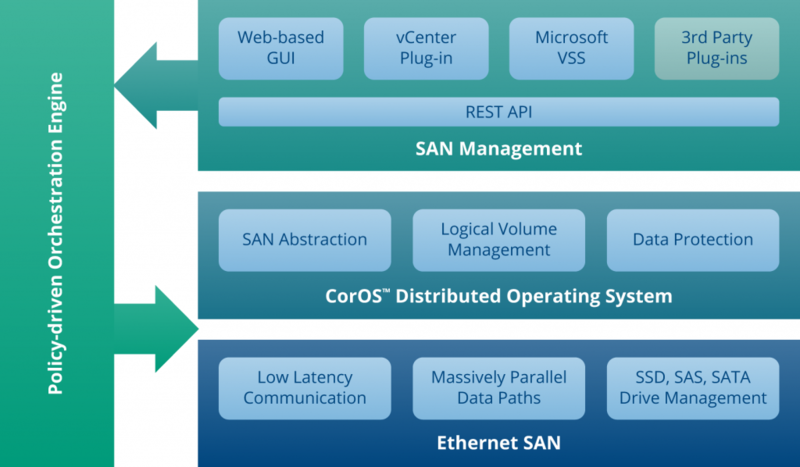 CorOS is designed to enable many individual systems to be managed as a single logical system, turning storage into a shared, global pool of disks. By wrapping the system with a modern RESTful API, storage can be provisioned and controlled programmatically. Policy-based automation: A framework for defining and inheriting policies across storage resources. With a simple interface into a global pool of storage, many storage operations can be routinely automated. Coraid is building the tools and technology to enable instant provisioning, deep insight into performance and capacity, rapid remediation of resource contention, and intelligent reporting on usage, helping organizations move to self-service, scalable cloud architectures.